There are few things on this earth that can be described as having equally strong ties to both fly fishing and acid house music, but the bucket hat is one of them. This 360-degree-brimmed throwback piece is perhaps best described as the Marmite of the hat world, existing in a sort of sartorial quantum state, whereby it is always in vogue, and perilously uncool at the same time, depending on who’s wearing it. This phenomenon is perpetuated by the fact that every year at the same time the fashion journos roll up their sleeves and begin penning articles about how ‘the bucket hat is back’. And while the annual barrage may not tell us anything we don’t already know about the Britpop staple, its consistency does make one thing very clear: the bucket hat never went away. Not really. But why, you may ask. It doesn’t have the timelessness of a baseball cap, but this polarising accessory’s enduring relationship with menswear is down to its subcultural importance. After all, it’s been nothing short of uniform for everyone from OG hip-hop stars, to Madchester lads in the UK, to mahogany-coloured OAPs holidaying in Benidorm. That’s a pretty diverse style spectrum, we’re sure you’ll agree. When you take this into account and add in the cyclical nature of fashion, it’s no wonder the bucket hat keeps on cropping up over and over again. But regardless of its ever-present cult popularity, one thing that puts most people off giving a bucket hat home on their own hat stand is the fact that it can be notoriously tricky to pull off stylishly. Wearing a bucket hat is not a style move for the faint of heart. Get it right and you’re the coolest guy at Glastonbury, get it wrong and you’re somebody’s weird uncle out on a duck hunt – there’s not really any middle ground there. The trick lies in being clever about what you wear it with. Obviously, summer clothes are a bucket hat’s best friend (a bucket hat and winter coat is not a good look). Aim for simplicity – this type of headgear is a bold choice, so the rest of your outfit shouldn’t be fighting with it for attention. Opt for a plain tee, chino shorts and canvas trainers for a relaxed, festival-ready option. Or switch it up with a track jacket and joggers when the weather turns cooler. A plain, block colour hat should be your first port of call if you’re looking to keep things minimal but if you’ve got no qualms with making a statement, experiment with some patterns. It may surprise you to learn, but British headwear company Kangol does more than just flog dodgy flat caps to Samuel L. Jackson. Since the 1920s, the label has been producing hats for everyone from the Scout Association to The Beatles. These days Kangol is still going strong and the bucket hat has become one of its most iconic silhouettes. 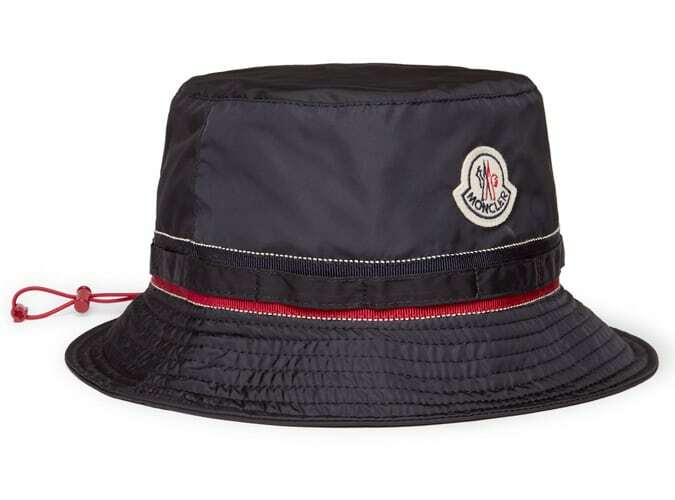 So, if you like your headwear to come with some heritage, then a Kangol bucket hat is a fine option. Founded in 1911, Italian sportswear label Fila originally set out making clothing for Alpine locals. However, after becoming well-known for its quality knitted garments and outerwear, Fila was later adopted as one of the brands of choice for the football casual subculture and later, the Madchester movement in the UK. Reni of The Stone Roses was rarely seen without his Fila bucket hat, and with the nineties revival now in full swing, it’s difficult to think of a better brand to buy yours from. Californian outdoors brand The North Face has been kitting out intrepid explorers and city-dwelling yuppies alike in its premium, performance gear for just over half a century. In that time it’s put its stamp on pretty much every type of clothing you could imagine, and bucket hats are no exception. For hard-wearing headgear that can hold its own whether you find yourself ascending Everest, or just traipsing around Glastonbury, The North Face will always be a winner. Known mostly for its down-filled jackets, premium Italian sportswear label Moncler is today a name synonymous with luxury. Having made jackets for famous mountaineers and supplied kit for the French Olympic skiing team, Moncler does have some sporting pedigree too, which is reflected in the lofty price tags. Some people would wince at the thought of spending upwards of £200 on a bucket hat, but if you’re not then check them out. Moncler isn’t the only label here to have kitted out its share of French Olympians – tennis great Rene Lacoste’s eponymous brand has done the same, earning itself something of an iconic status over the years in the process. Lacoste’s most recognisable piece is undoubtedly the polo shirt, but the bucket hat isn’t far behind. The brand’s version of this summer staple has been a common sight at football matches, festivals and beyond for many years now, making it one of the best to add to your wardrobe if your a fan of that classic, terrace style. When it comes to stripped-back Scandi staples, alongside up-to-the-minute, trend-led pieces, there is no name on the high street as reliable as H&M. The Swedish chain has been saving us a fortune for the best part of a century and is always a safe bet when it comes to picking up something a little different without emptying your bank account. Case in point: you may be unsure of whether or not a bucket hat is really for you, but here, you can afford to experiment. Whether you’re out hiking the Scandes, or simply commuting to work through the city, Swedish favourite Fjallraven will always have you stylishly equipped along the way. The heritage outdoor brand is famous for its G1000 fabric, which can have its water repellency and breathability tweaked on the go using a DIY waxing approach. The brand’s bucket hats are constructed from the same hard-wearing stuff, so you’ll be good to go, come rain or shine. Stockholm-based fashion label Acne has been dressing achingly hip urbanites since it first opened its doors in 1997. The brand has become known for its simple high-quality clothing, denim, and more recently, its emoticon face motif. In terms of accessories, the bucket hat has long been one of Acne Studios’s go-to products. Expect quality construction, premium materials and plenty of that stripped-back, Scandi styling. Liam Gallagher has made a monumental comeback in recent years but his clothing label never really went away. Pretty Green is the embodiment of Gallagher’s trademark contemporary mod style and offers key items of the look, such as parkas, cycling polos and desert boots, all with a subtle signature twist. 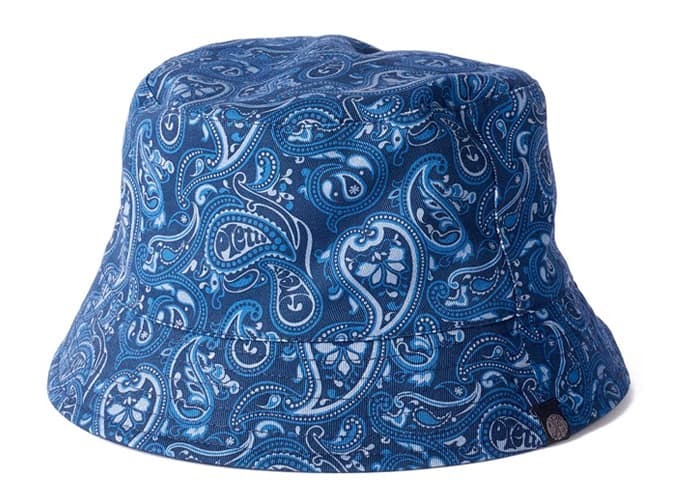 As far as headwear goes, the bucket hat has always been a recurring item for Pretty Green – something which is no doubt largely down to the brand’s Manchester roots. Look for reversible designs, classic styling and plenty of psychedelic, paisley patterning. Established in 1918, Texas-born Dickies is the definitive, all-American workwear label and carries the heritage to back it up. The company began by making overalls but it wasn’t long before its range of products expanded to include pretty much any type of clothing you could care to think of, bucket hats included. For simplicity, rugged build and no nonsense, a bucket hat, you can’t beat this iconic workwear legend.